Weeds quickly destroy neat garden beds. They rob the soil of nutrients and choke out the roots of your desired garden plantings. Dealing with weeds quickly before they have a chance to get a deep hold in your garden is the best defense. New beds are more weed prone than older, established beds. After growing in a section of garden for several years, weed problems will diminish but you must stay on top of them to keep them from taking over again. Prepare new beds for planting. Cut out and remove any sod layers from the bed before tilling. Turn over the top layer of soil and remove any weed stems or roots in the soil. Weeds might grow back from these parts if left in place. Lay black plastic or garden weed cloth over areas overrun with weeds. The plastic heats the ground under it and kills the weeds. This might take an entire season to work effectively. Surround beds with edging. Edging keeps lawn weeds from moving into flower beds. Use wood, plastic or stone edging that extends 4 or more inches into the soil around the beds. Weed the flower beds often. A weeding tool is a long pole with a forked end. Push it into the soil next to the weed stalk. Lever the weed out, pushing the forked end against the weed stem and roots under ground. Dig weeds as soon as you notice them so they have no time to produce seeds. Use mulch. Inorganic mulch such as gravel or organic mulches such as bark preserve moisture in the soil and keep weeds down. Lay down a weed barrier cloth first, then add the mulch for additional protection in weed-prone areas. Use herbicides. Use caution with herbicides around children or pets and follow all package instructions. Organic herbicides also are available. Be aware that some herbicides might damage your flowers as well as the weeds. Weed garden beds every spring before planting new flowers. Keep your flowers well watered and healthy. Many weeds thrive on dry conditions and will overtake flowers in an ill-kept bed. Avoid garden fertilizers with weed control. Many garden wildflowers will die if exposed to these fertilizers. Never compost weeds, seeds might survive to sprout in your garden when you apply compost. 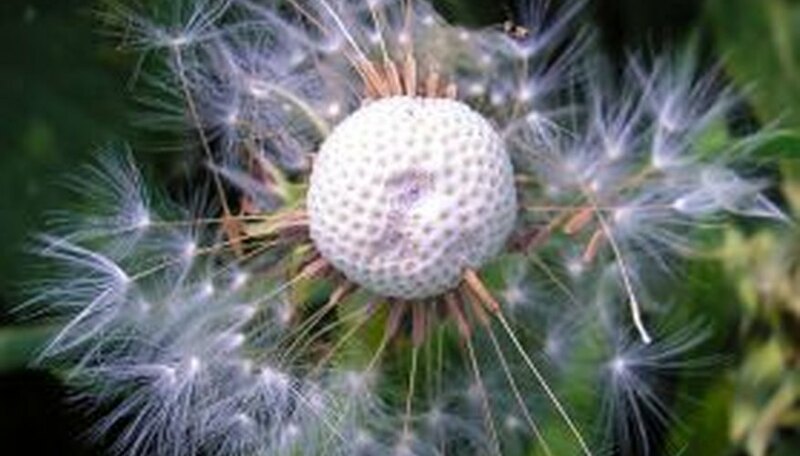 Never lay pulled weeds on your lawn while working as this might spread seeds. Place them in a garbage bag or lay them on a layer of newspaper.